Got three-phase machines and only single-phase power? We've got the solution! FULL POWER transformer type of Phase Converter. 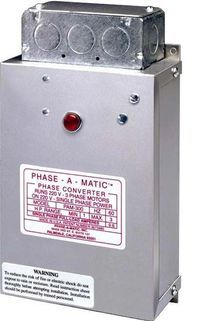 Phase-A-Matic, Inc. might possibly manufacture and distribute more Rotary and Static Phase Converters combined than any other manufacturer in the U.S.A., having earned a name for being of the highest quality and proven dependability, including in service, technical support and uptime that is available anywhere. We know that technical support is important for your power conversion success. Our technical support team is dedicated to assist you with every aspect of your converting needs from choosing the right converter to any help you may need in the proper installation and operation of the converter on your machine. Our technical expertise is derived from over 44 years of experience in phase converter systems. We have amassed a huge database of information on virtually every kind of application possible, from very basic to the most sophisticated of applications. Call us toll-free at: 1 (877) 528-2809.